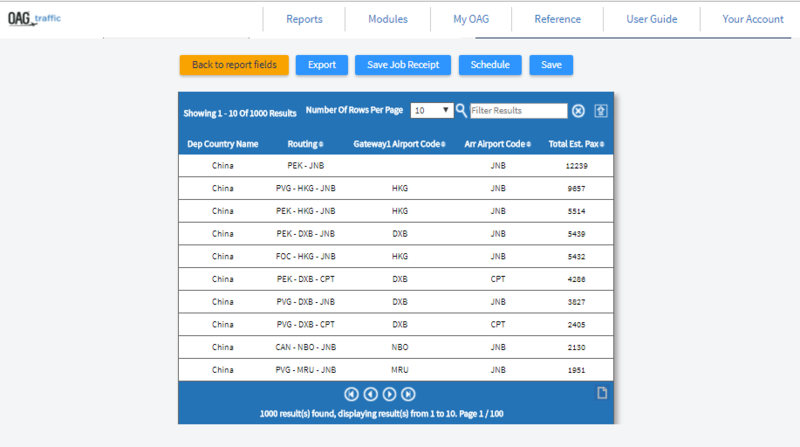 OAG Traffic Analyser provides you access to OAG's passenger bookings database. It comes with integrated mapping so you can create dynamic visualisations of passenger traffic flows at the touch of a button. 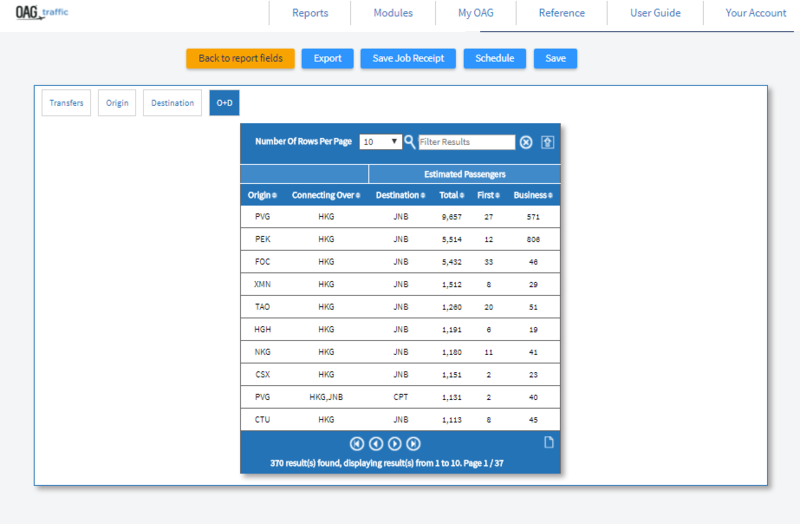 OAG Traffic Analyser sits within the OAG Analyser Suite of modules, each accessed via a common dashboard. Each module has been designed to have a high degree of commonality so that screens are visually comparable, and users of one will find it easy to use the other modules and create outputs in similar and comparable formats where needed. OAG Traffic Analyser has been designed to meet the needs of a wide variety of users. This means that the occasional user can access data quickly and easily via standardised reports. Equally, the user requiring in-depth analysis can configure settings, tailor outputs and create their own reports. OAG Traffic Analyser data is primarily MIDT data and is sourced from our partnership with Travelport as well as data from other sources. 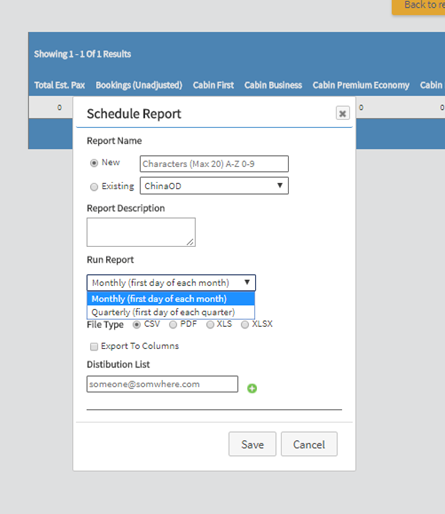 The tool has both unadjusted and adjusted booking data. Unadjusted data is only GDS data and includes booking and average fare figures. Adjusted data for bookings includes GDS bookings and is built upon through calibration of a series of specially developed algorithms using external reference data sources to estimate the true market figure. There are two fields with fare data, one containing average fare data which is provided by Travelport and the other which provides weighted average online fare data. Online fare data is received in the third week after the end of the month. The unadjusted data is updated in the second weekend of each month and it contains data for two months previous to the current month. The adjusted prelim data is a draft version of the adjusted data. It contains data from Travelport, the other GDS’s and is aggregated up however some external sources do not submit their data until three months after the travel month hence why it is preliminary data. The prelim file is also loaded in the second weekend of each month and gives data for two months previous to the current month. The adjusted final is a final version of the adjusted data. This is also updated monthly but in the third weekend of each month and it contains data four months prior to the current month. Currently (July 2017), the online fares represent network-wide, route and flight level available fare data for selected carriers, and is collected on a weekly basis. The collection of raw data uses several different methods and relationships. We have an exclusive long-term relationship with RDC to provide the available fare data. The data collection is supplemented by collection via airline pricing APIs, OTA (online travel agent) APIs and additional manual checks and collection to ensure quality and consistency. The data is collected for specific points throughout the sales-cycle of each flight and at the same points across all routes and airlines in order to maintain consistency. From this raw data-file of millions price-points, an indicative monthly average fare is generated, directionally, for each airline and airport pair, using a proprietary algorithm that builds a route-specific booking profile based on several core indicators derived from our years of pricing and revenue management experience. 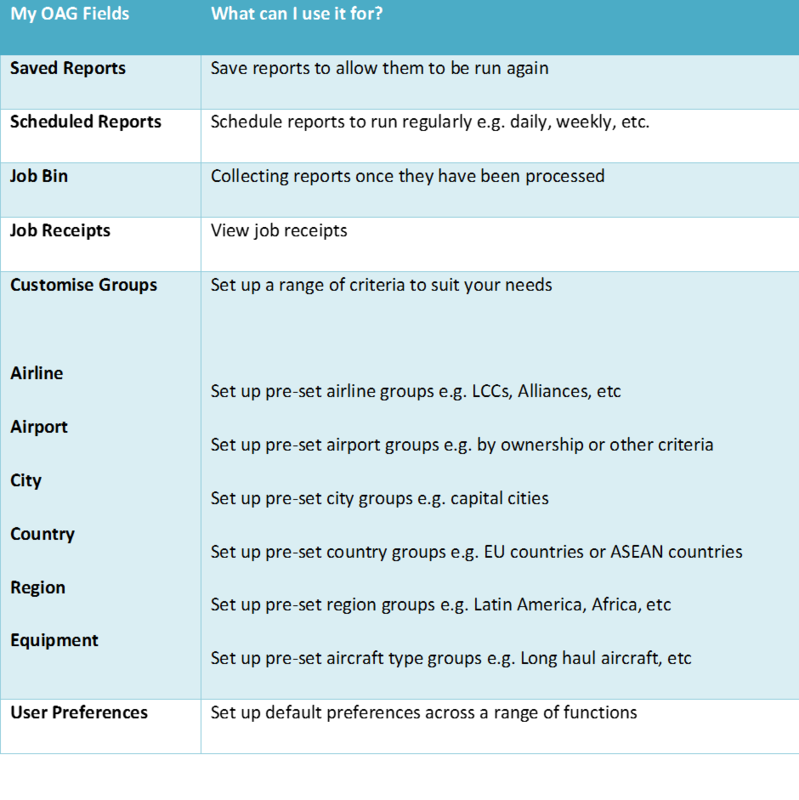 This guide provides all the information you need to start using OAG Traffic Analyser. It has been designed to walk you through all of the steps involved with getting the data you need from Traffic Analyser and can be used on its own, or in conjunction with the user guide videos on our website. There is also a glossary of terms on our website which explains both standard industry terminology and some of the more obscure terms used, and a ‘frequently asked questions’ section. If you have any login or account issues please contact ContactUs@oag.com. If you would like to give feedback on your experience of using Traffic Analyser or if you have any problems using this tool please contact your account manager and they will be able to help you or pass you on to the revelant department to help. 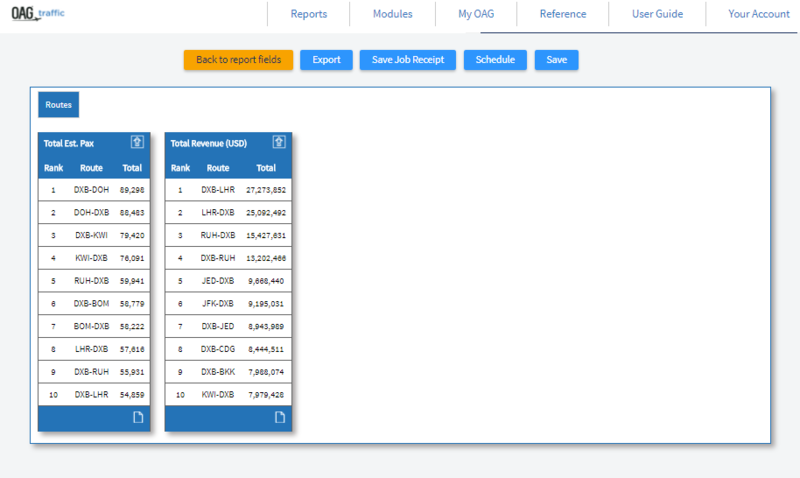 When you log into OAG Analyser you will see a screen like this which is the dashboard for the OAG Analyser suite of modules. Each product you have access to is listed along the top right and also in middle of the screen. Your account number is located at the top left of the screen, where it says welcome, and you need just one account and login to access all of the OAG Analyser modules you subscribe to. To open Traffic Analyser, the module covered in this user guide, you can either click on the module name at the top of the screen, or click on the passenger icon located to the left of the Traffic Analyser section. 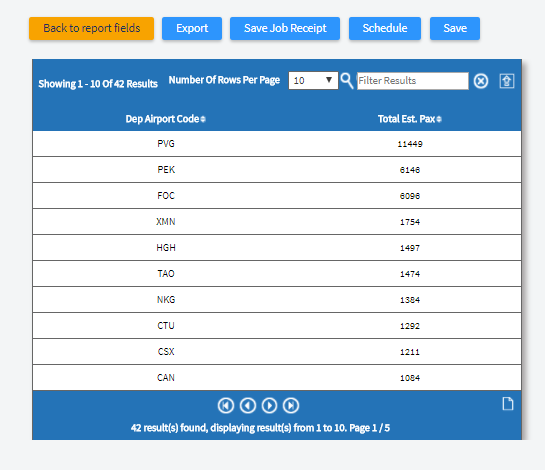 In the central area you will see the 6 reports available in Traffic Analyser and below is the Job bin which stores reports once you’ve run them. Below that you can view any Saved and Scheduled Reports. Next is the My OAG section which allows you to save reports, run scheduled reports at a certain time, and to customise groups of information to make running reports with similar queries easier. The functions in this section, and the reference section next to it, are covered in more detail later in this guide. The User Guide option takes you through OAG’s help pages which include this guide, some FAQ’s, a glossary and some videos to guide you through how to use each report. There are 6 reports available in Traffic Analyser. We describe how they work here and provide you with a worked example of each report in this section. You can also access short video guides from our user guide that replicate the content provided here. 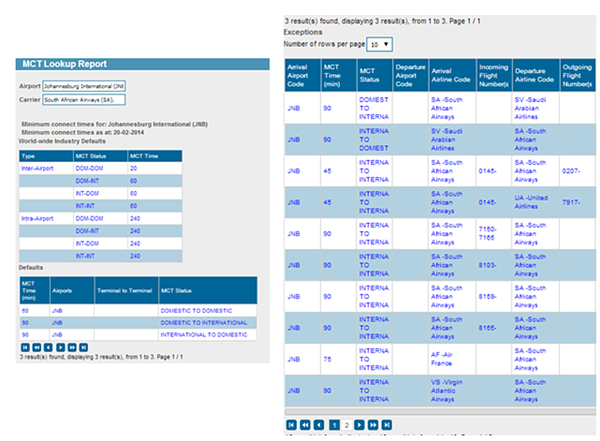 From the home screen you can click on any one of the report names below and you will be linked to a new query screen. 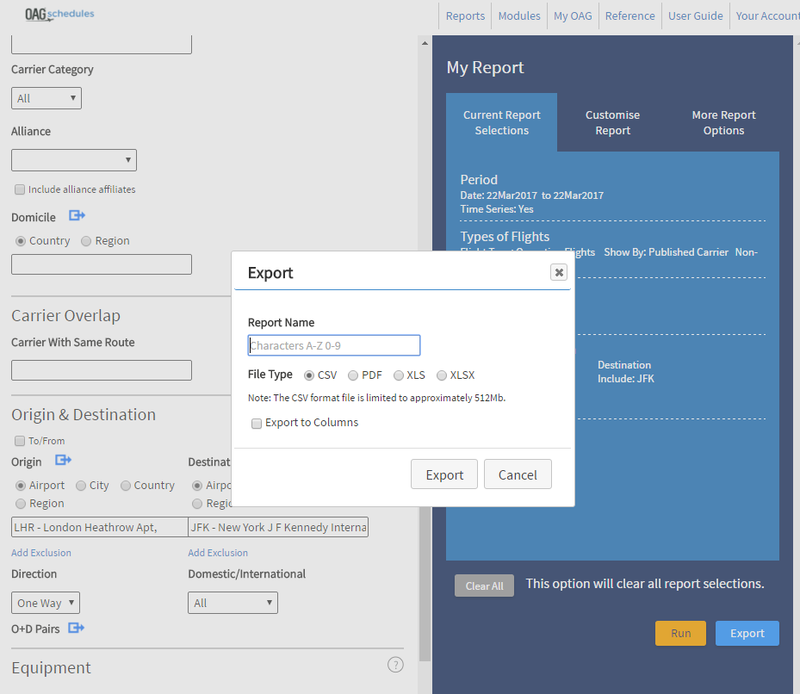 Much of what is covered in the O&D Report guidance can be applied to the other reports..
With this report you can extract data on estimated passenger volumes for flights from an origin airport, city, state, country or region to a destination airport, city, state, country or region. You can also specify up to 2 different gateway points. These can be airports, but could also be a city, state, country or region and they identify the routing that the passenger takes. Like most reports in Traffic Analyser, and other OAG Analyser modules, it has numerous options to tailor the data request to what you need, but not every box needs to be filled in every time. Often you may only need to fill in a few of the options, so it’s worth spending a bit of time familiarising yourself with the query screen. We’ll look firstly at Period. You will see from the dropdown list there are three time period options that can be selected. These are month, quarter and year. The default is month. Data in Traffic Analyser is available back to 2010 - (if your subscription includes that) and it takes about four months for Adjusted Bookings data to be finalised and loaded into OAG Traffic Analyser. The adjusted prelim file does provide data for the two months prior to the current month (to understand more about the different types of data please see page 4). When you log into the Analyser portal you will see the Database load schedule in the Traffic Analyser box on the right hand side of the screen which shows you the latest months of data available and when they were loaded. If the time series box is not selected the data is shown aggregated for the time period selected. If you want data for two time periods so you can compare them, select the ‘compare to’ box and you’ll see more options to compare time periods. The next group of parameters relate to the Type of Flights. As you can see, operating flights, published carriers and non-stop flights are the default options here, but you can change these if you want. 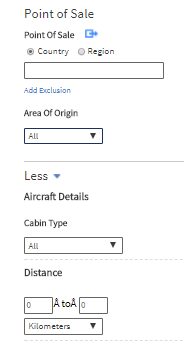 You may not need to change these but if you are interested in codesharing arrangements between airlines you may want to click on ‘both’ so you can see both the flights which the carrier operates and those that it doesn’t operate, but still sells. 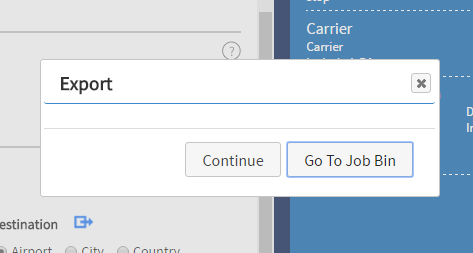 Then in the Carrier section, you have two options. If you leave the first field - Carrier (dominant) - blank, data for the dominant carriers will be included. The dominant carrier is the one which operates the longest leg. Otherwise, you need to specify which carriers, or carrier groups, you want to view data for. There are two ways of inputting carrier names – either by 2 letter code separated by a comma i.e. 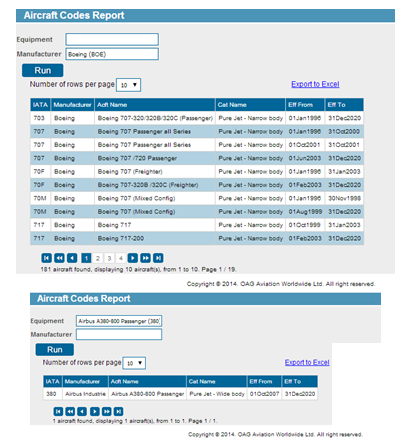 AA, BA, WN, etc., or by typing in the carrier’s name which will produce a drop down list to select from. You can add as many airline names or codes as you like, as long as they are separated by a comma. If you want to save a group of carriers to make future queries faster, you can do so. You do this by clicking on blue arrow logo at the end of the field. This opens up a new box. You enter the carrier, or carriers, you want and then you have the option to either save your selection with a name (so you can revisit it in future) or simply enter the details and run your query. We’ll run through the steps to save the query here. You’ll see here that we’ve created a group for US major airlines which then appears in our Saved Groups list. Firstly, type in a name for your group – we’ve called it ‘My 1st group’. 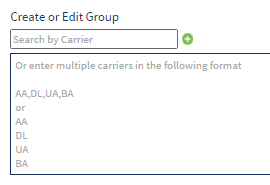 Then, add the carriers you want to include by typing in the two letter code, or name in the airline field. Click the green + symbol to add them to the list. Once you have added all the required carriers, click on Save to keep the selection. Then click on OK which returns you to the query page with the carriers you’ve selected added to the required field. You can also exclude a particular carrier, or group of carriers. 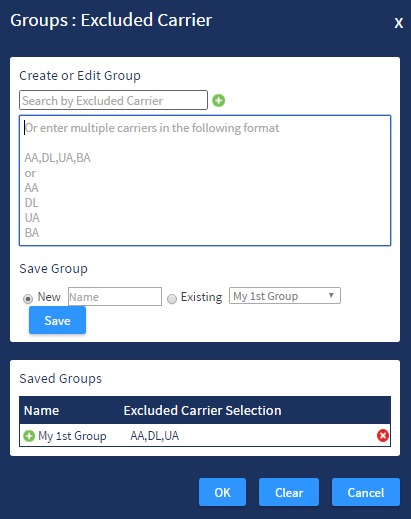 Click on Add Exclusion below the carrier box and, as before, you can either select a single carrier in the Excluded Carrier (Dominant) field by using their two letter code, or name, or select multiple entries. Under the carrier selection boxes, you will see that there is a box called Carrier Advanced. 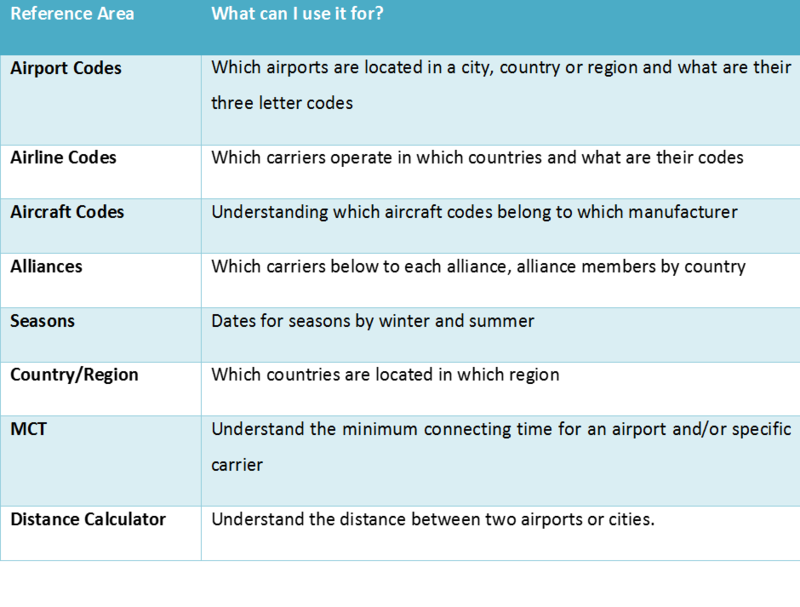 If we check the box, then this unlocks options to be more specific about which carriers operates which legs of the routing and extract data for analysis of that Carrier Leg 1 refers to the leg between the origin airport and gateway 1 airport, and so on. 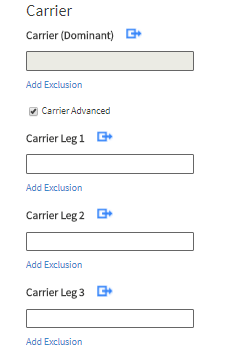 You can select single or multiple carriers (or exclude them) for each of the 3 legs. 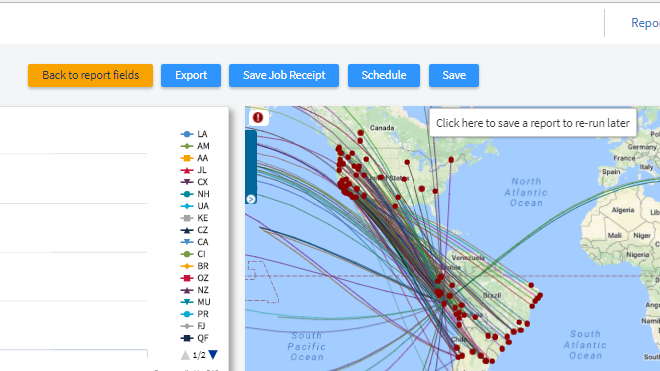 This feature is particularly useful for analysis of domestic feed traffic to long haul routes. 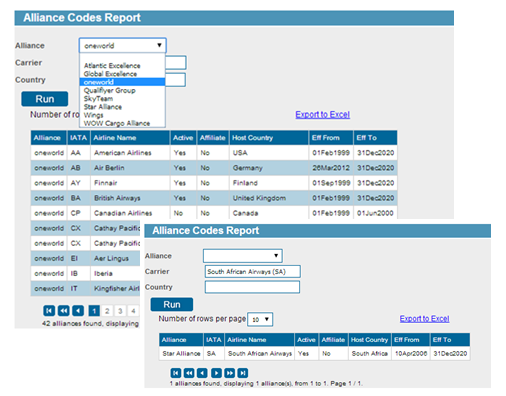 In this section, you can select data for a specific alliance or for airlines not in an alliance, which we term ‘unaligned’. The default is no selection. 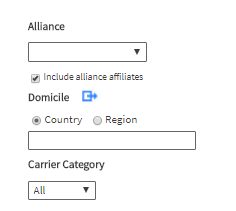 You can also choose to include alliance affiliates. The next option in the Carrier section is Domicile. 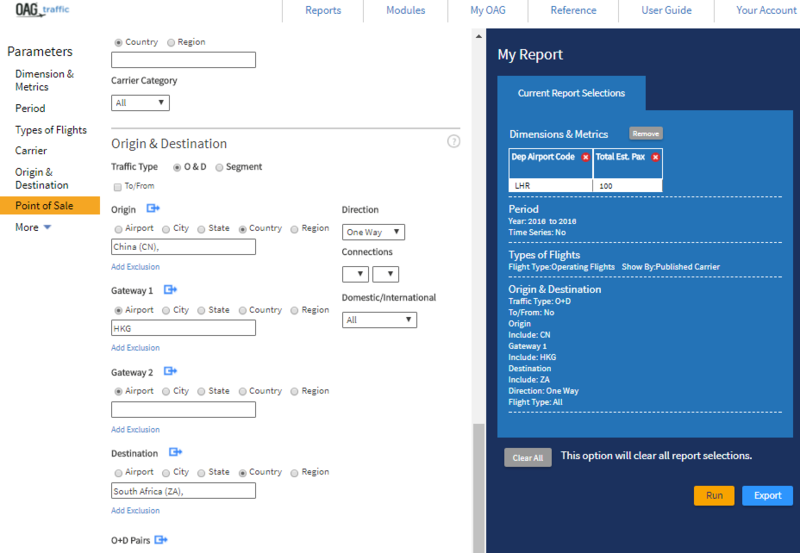 You can select a Domicile Country, or group of countries or region(s) where an airline is based. As with the other options you can save a selection if you need to. 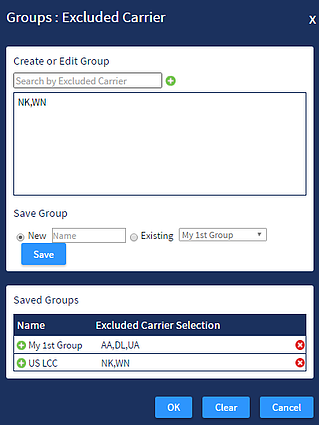 The last carrier option is Carrier Category, where you can select either All, Low Cost or Mainline carriers. The default is All. 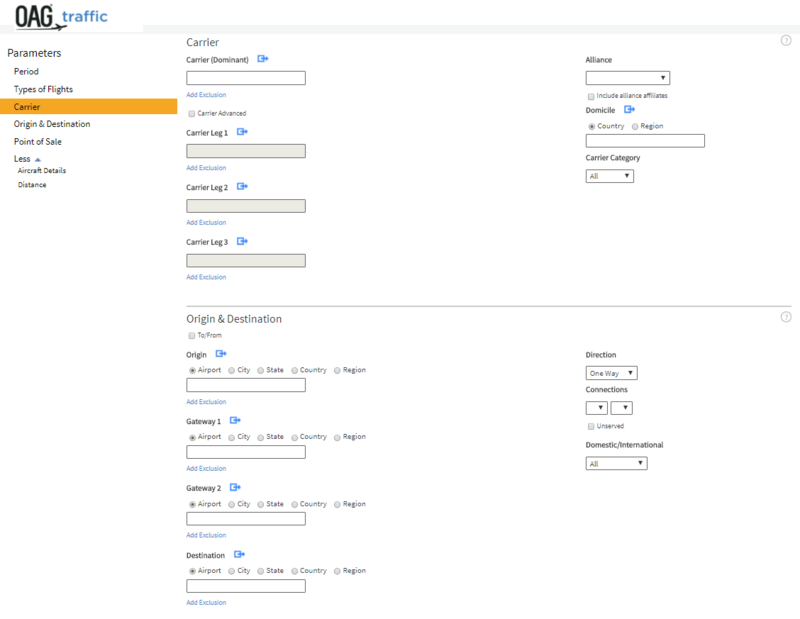 As before, if you leave the Origin and Destination fields blank, data for all origins and destinations will be included. Doing this would return a lot of data however, so it’s usually better to select a specific airport, city, state, country or region. Sometimes you might just want to look at all bookings to and from one specific airport, city, country or region. Clicking on To/From allows you to do this and you can look at everything from an origin point. When you select an origin and a destination you are choosing to look at all airline bookings from the origin to the destination. If you want to extract bookings data for both directions, then click on the Direction box, which will allow you to select two-way data There is also an option to aggregate data. Data for each direction will be shown separately but if you use the ‘aggregate’ options then the two-way data will be combined into a single figure. You can select either a single Origin or Destination or a multiple selection. 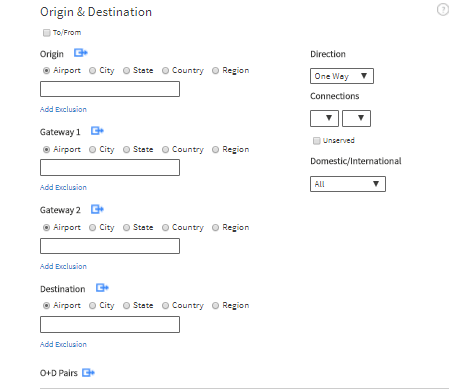 Between origin and destination there are two more options to select Gateway 1 and/or Gateway 2. All of these options can be selected by airport, city, state, country or region. Gateways are connecting points. To the right of the Origin, Gateway and Destination options, you can also specify if you want to look at data which has exactly a certain number of Connections, more than a number or less than a number,with a maximum of 2 connections. 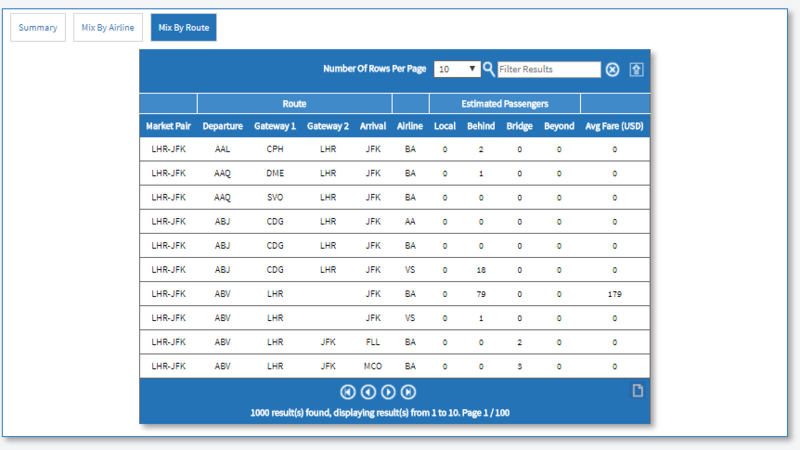 There’s also a box which lets you see passenger bookings made on routes which are unserved by direct services, or unserved by the direct services of a particular airline. This means passengers are finding other ways to travel to where they want to be, either connecting at other airports or using other airline services. We’ll show a quick example here of the unserved feature. We’ll select 2016 as the year, Air France as the carrier, and look at unserved routes between France and China, making sure to select the box marked Unserved. We then run the report. This results in 8 tabs of data, and the one we want to select is the Country tab. This shows that there are over 45,000 passengers travelling from France to China on indirect routings. Lastly, on the right, you can choose to limit your query to just domestic, or just international passengers. The default is all. At the bottom of the Origin and Destination section, there is an option to choose specific O&D Pairs. When you click on it, it opens up a box on the right hand side of the screen. 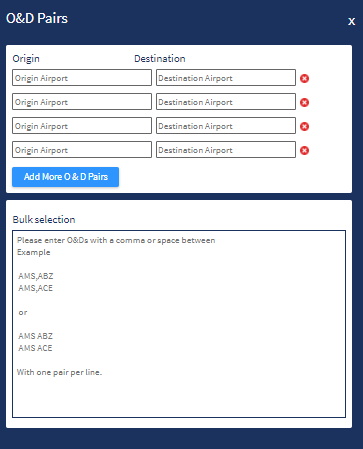 You can use this box to enter specifc O&D Pairs, or you can use the bulk origin destination pairs field which lets you paste in a selection of origin and destination codes from another source. These need to be inserted as the three letter codes separated by a space or comma. As before, if these fields - where there isn’t a default or drop down list to choose from - are left blank, the data extracted will cover all countries, and all cabin types, for example. 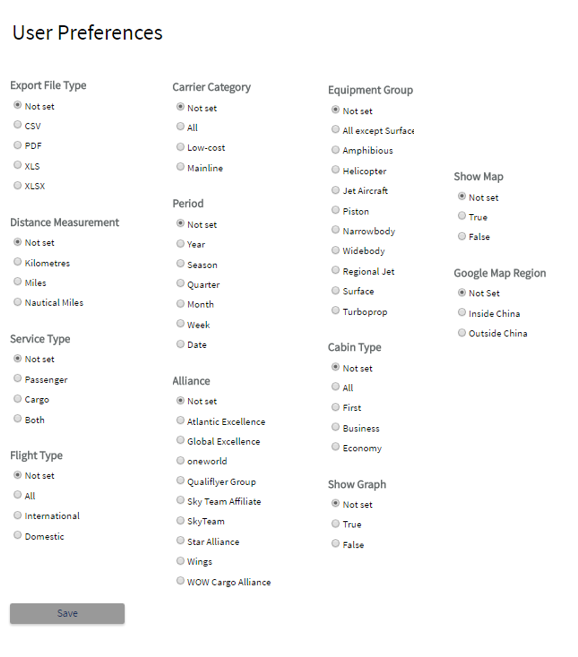 As before, if these fields - where there isn’t a default or drop down list to choose from - are left blank, the data extracted will cover all countries, and all cabin types, for example. Next you can specify a Point of sale. This is where the booking was made, either a country or region. This is helpful for understanding the composition of traffic for the flight and whether one market or country dominates the traffic travelling on a route. This can also be identified using the Area of Origin option which enables you to select only data for travel sold in a local market, within the region or outside the region. 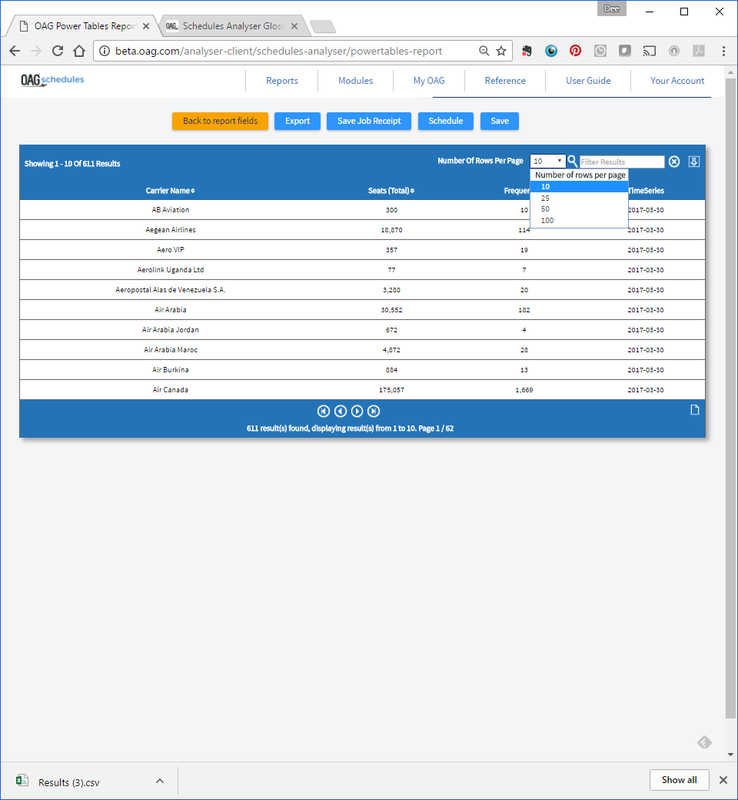 Below Point of Sale there is an option to open up an additional list of parameters to allow you to further refine the data in the report you are extracting. 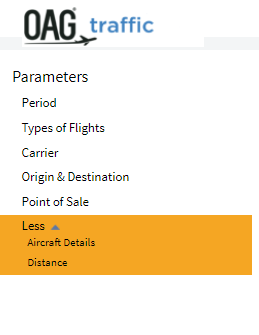 Clicking on the More field below Point of Sale opens this up and there are two more parameters, Aircraft Details and Distance. There are six Cabin type options – All (default), First, Business, Full Y, Premium Economy and Discount Economy. The final option is Distance. You can specify a maximum or minimum distance to further refine your query. 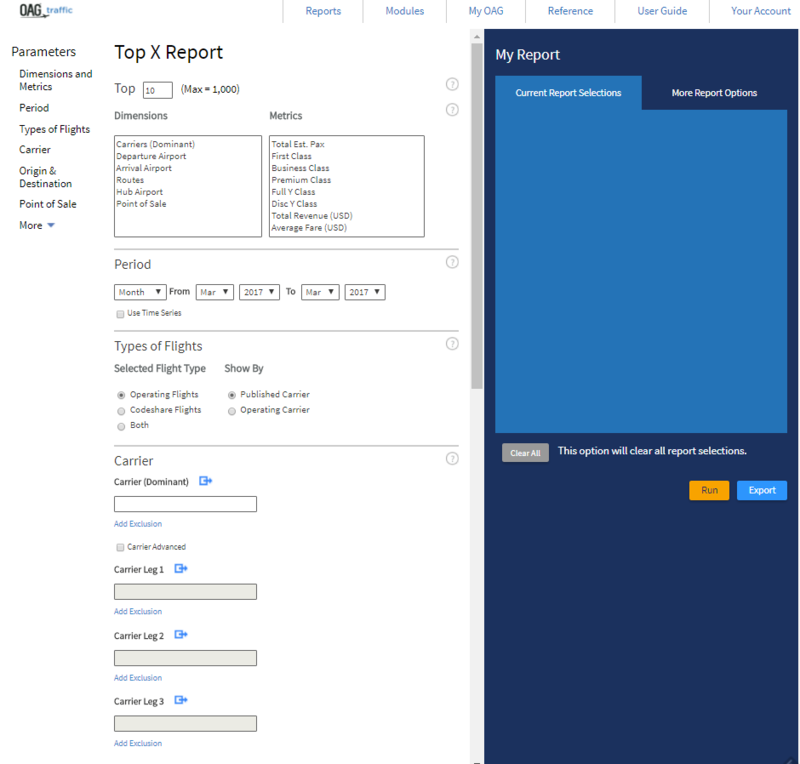 As you define your report by selecting Parameters on the left hand side of the screen they appear in the Current Report Selections tab on the right hand (blue) side. 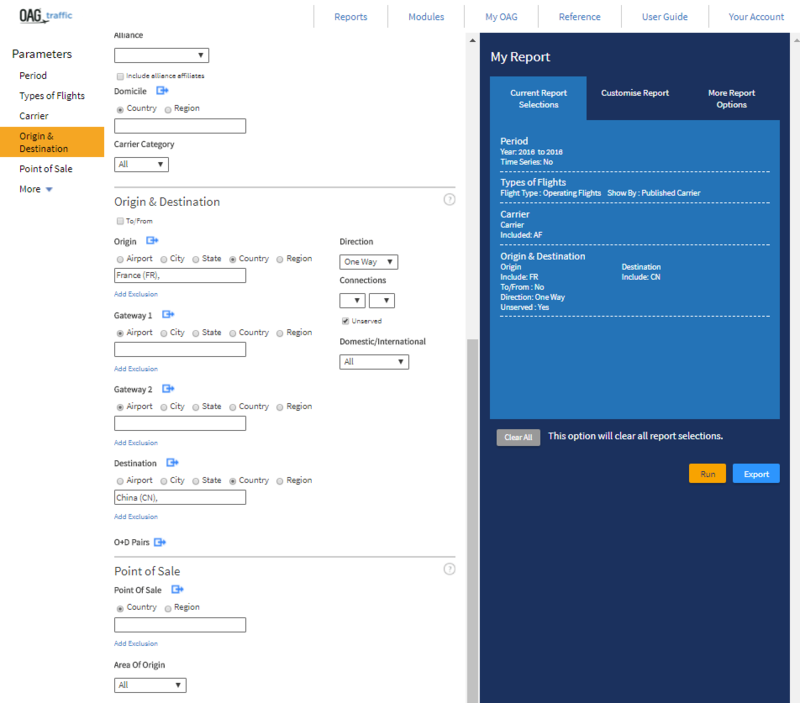 Once you’ve selected all the parameters you require, you have the option to customise the report further. 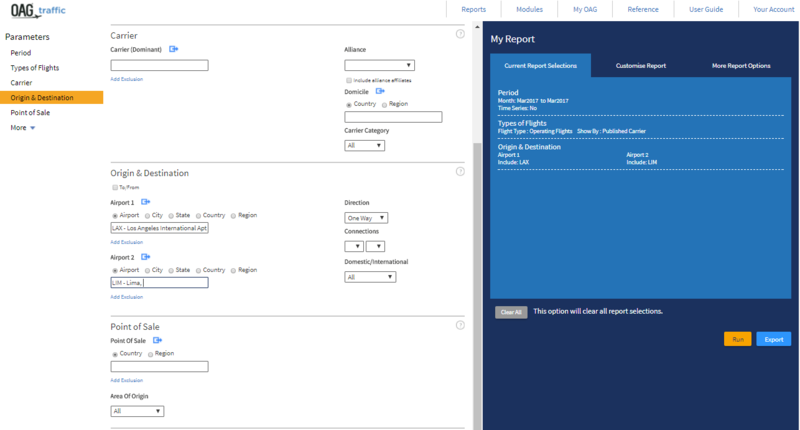 On the right hand side of the screen in the My Report section, you can click on the second tab, Customise report. At the bottom of the query screen (this is there whichever tab you have open) you have the option to Run the query or Export it. You’ll see from the example below that once you click run, the results are displayed in the format below. Each of the three areas has an arrow on the right, either in the top right hand corner (map) or the bottom right hand corner (chart, table). Clicking on the arrow maximises the table, chart or map to the full screen. Clicking on it again minimises it. 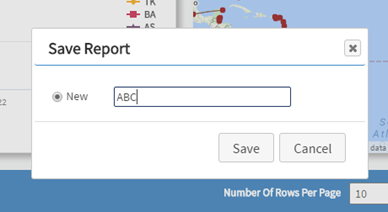 Running the report means the data appears on your screen, and if there are less than 1,000 rows, you have the option to click on the page icon at the bottom of the table and export as a CSV file. If the report is larger than 1,000 rows, you will have to export it and retrieve it from the Job Bin. Clicking on Modify Graph allows you to amend the outputs in the graph as displayed in the image below, and at the top of the graph there are 4 small lines which, if you click on them, open up the export options for the graph. You can send the graph straight to print or download in several different formats including PDF, PNG, JPEG or SVG vector image. 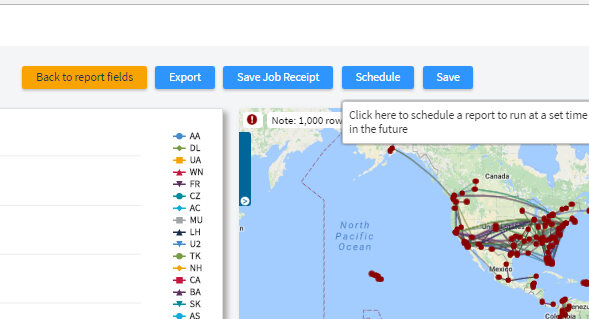 On the map, clicking on the blue tabs on either side of the map opens up Plot Options on the left where you can amend the location and format of labels and lines, and change the colour of the lines –if your query includes several carriers this can be very useful. The tab on the right allows you to see all of the itineraries in the query and select one. You can also zoom in and out on the map using the + and – symbols on the top right hand side and recenter it by clicking and dragging the map to where you want it to be centered. 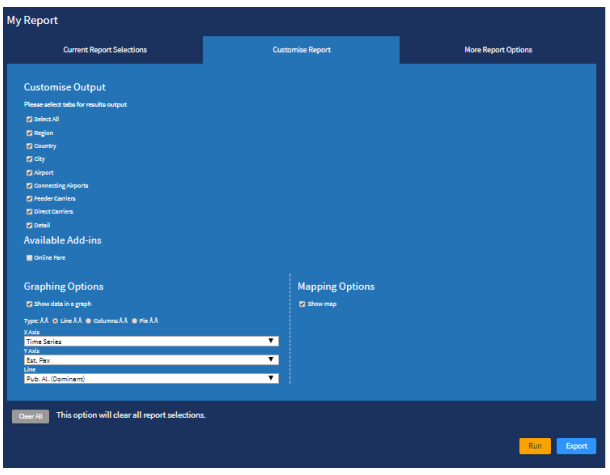 Reports can also be run regularly and emailed directly to yourself, customers or colleagues by selecting the Schedule option at the top of the report output page. You can give the report a name and select the frequency that you want to see the report run and the output format. Finally, enter the required email address(es) in the field below email address, click on the plus sign to add them to the box below and click on save. 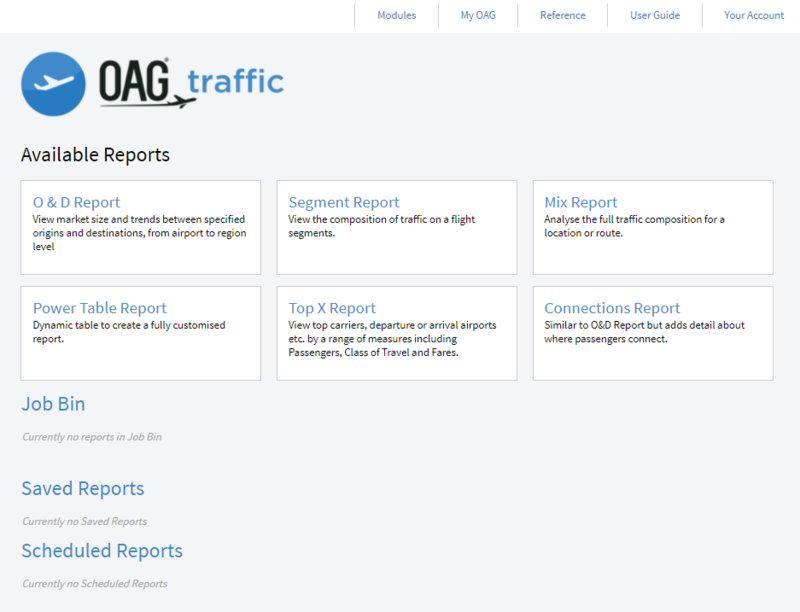 Scheduled reports appear in the OAG Traffic Analyser home page under Scheduled Reports. You can see the Report Name, Frequency, File Type and Recipients, and when it was last run. You can open it from here, or edit any of the fields by clicking on edit. Once you’ve run the report, you can download it in a range of ways. Click on Export and an export box opens. Give your report a name and then select the file type – you can choose from a range of options including CSV, PDF and XLS. If you know that you will always want to export in a particular format, you can save it as a default in the User Preferences section (we cover how to do this later in this guide). Once you’ve given your report a name and selected the file type, click on Export. 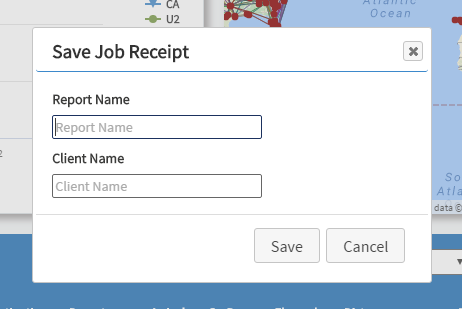 This box then appears and you can choose to continue with another query, or go the job bin where the report will be processed. The job bin looks like this and can be accessed by clicking on Go to Job Bin, or from the home page in Traffic Analyser. The envelope to the left of the ID number indicates whether the report has been opened or not. Reports will remain in your job bin for 4 days, then be deleted automatically. You can open the report and edit the parameters or download it from here for further analysis. The user guide link from Traffic Analyser for this report takes you to our website where there is a short video with a worked example of how to run an O&D report. 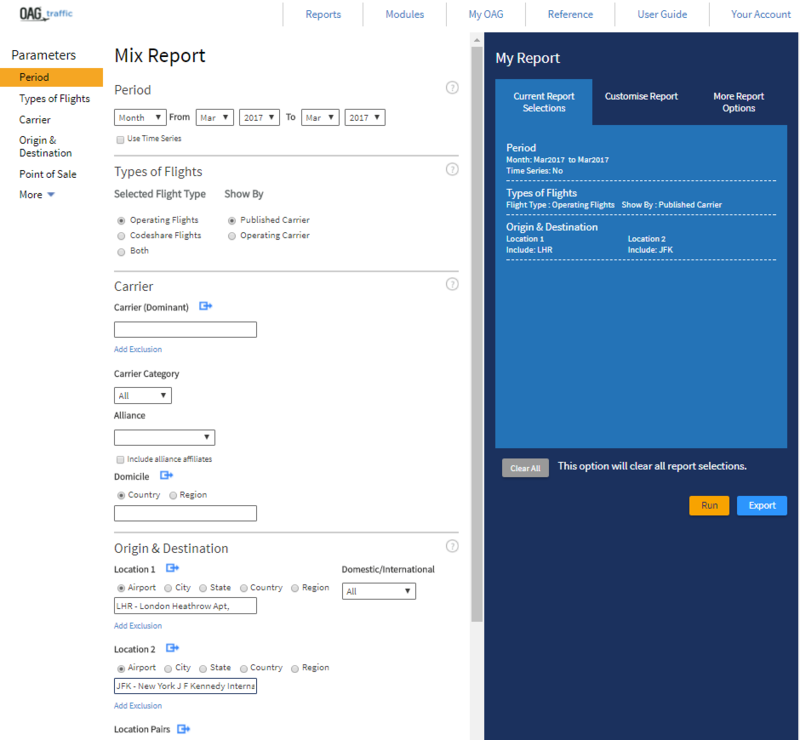 This report allows you to identify passenger bookings on an individual flight segment. The parameters, query screen and report outputs are similar to the O&D report so we won’t repeat the guidance in the section above, but will focus on what is different. 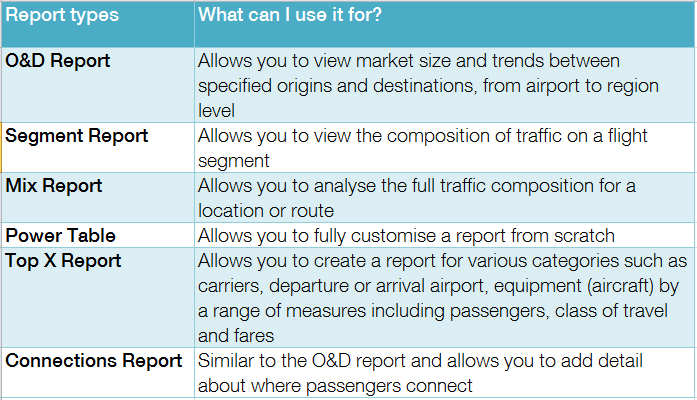 The main difference here is that while the O&D report is concerned with traffic between an origin and destination, and provides data about how many passengers use intermediary points to connect between flights, the Segment Report focusses on individual flight stages between airports. In this report there is no option to compare time periods and there is no advanced carrier option – simply because the report is focused on a flight segment, meaning there is only one carrier involved. There is no ‘unserved’ option for the same reason. The main difference is in the Origin and Destination fields. There is an option for Airport 1 and Airport 2 which are either end of the Segment we want the data for. We’ll walk through an example here to show what the output of this report looks like. We’ve entered LAX in the Airport 1 field, and LIM in the Airport 2 field. The time period is the default latest month, and we don’t need anything else. We’ll click on ‘Run’ to run the report. The results appear in a table like this. There are three output tabs – segment, direct carriers and detail. 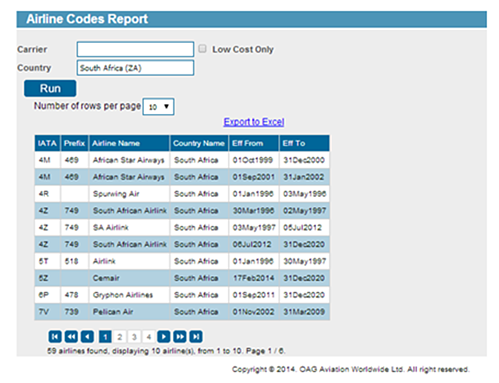 The segment table shows the summary output of your query – in this case the total passengers for the LAX-LIM routing. Selecting the detail tab displays the results in a table, by itinerary. You can see that some passengers begin their journeys behind LAX and some end their journeys beyond LIM. We will cover this terminology in the next section. The user guide link from Traffic Analyser for this report takes you to our website where there is a short video with a worked example of how to create a segment report. The next report we will look at is the Mix report. The Mix report provides a different way of looking at traffic on an O&D pair. It allows you to see the composition of traffic on the O&D pair in four different ways which we outline in this section. 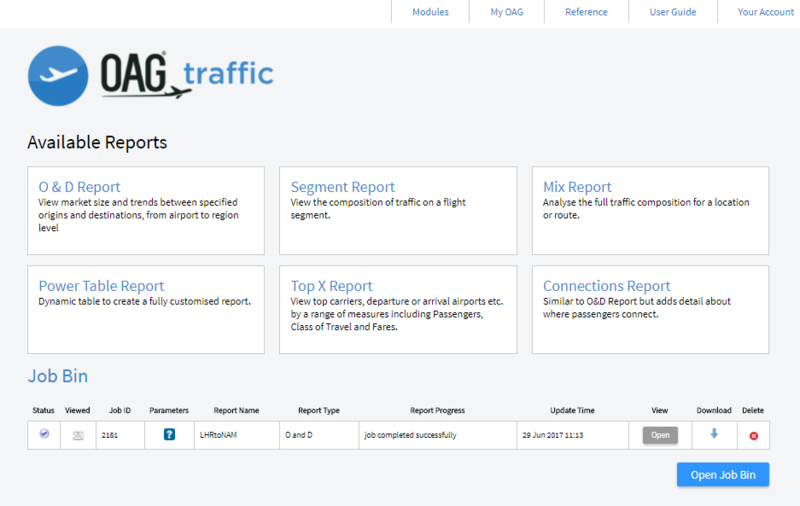 As before, you can click straight through to the Mix Report from the OAG Traffic Analyser home page. A new screen like the one below will appear:. As before the report can be run with a variety of parameters including for all carriers, or a selection; by alliances, by specific origins and destinations (at different levels e.g. airport, city, state, country and region). In the same way that we walked through how to run an O&D report, we’ll do the same here. Many of the fields are similar, so we will focus on those that differ from that report. 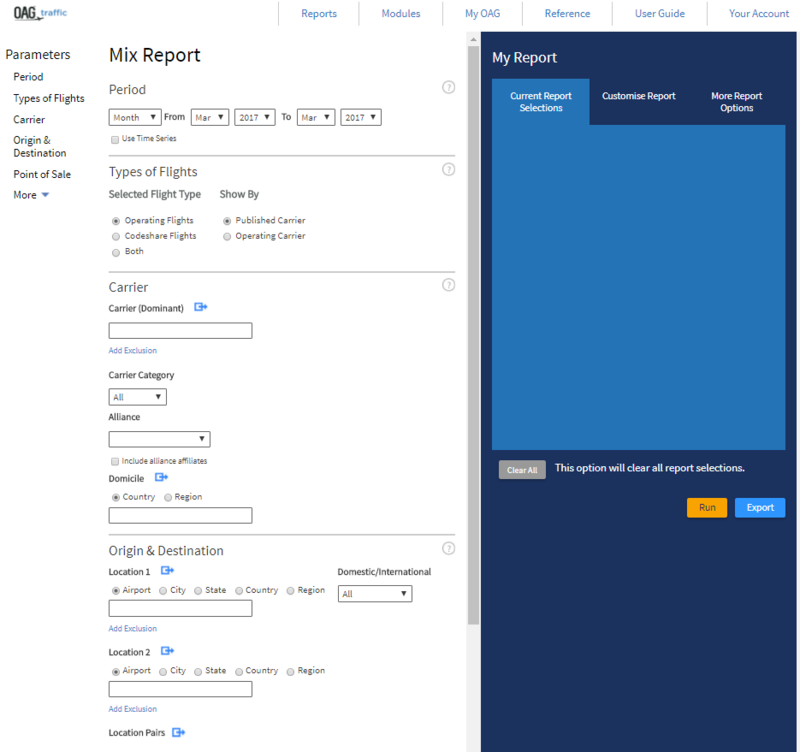 The mix report query screen is very similar to the O&D report, with one key difference, in the Origin and Destination parameters. 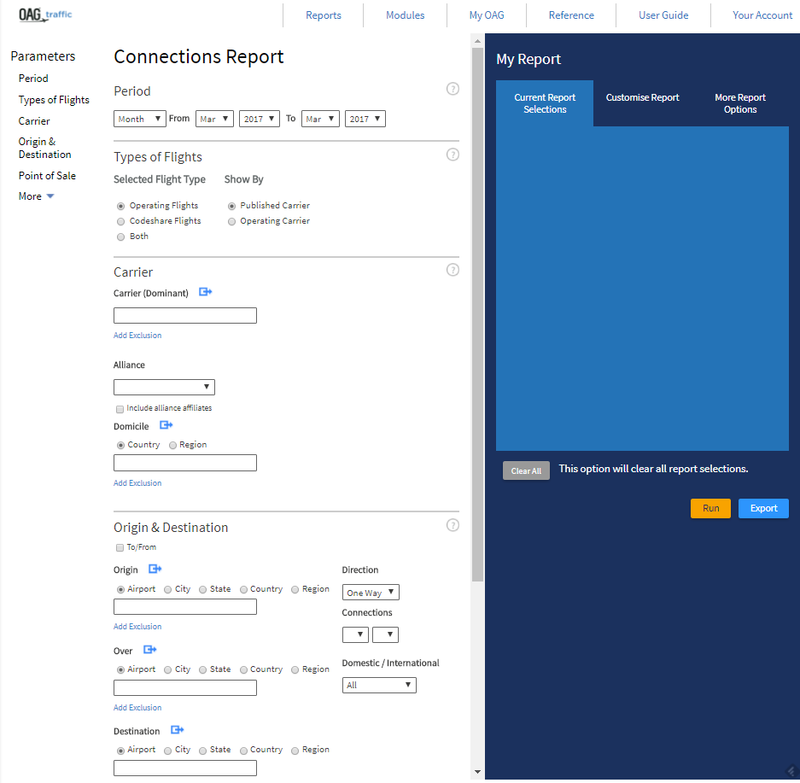 In this report you choose a Location 1 and Location 2 which should correspond with the airport (city, state, country or region) at the start and end of the flight segment you want to query. The output of this report includes the mix of traffic types on the route. There are four types of traffic identified in the mix. First is ‘local’ traffic, where the passenger simply travels between the origin (Location 1) and destination (Location 2) of a non-stop flight. Next in the mix is ‘Beyond’ traffic, which are those passengers who take a connecting flight after the flight which originates from your selected point of interest, so from Location 2. Then there is ‘Behind’ traffic, which is the traffic which originates behind Location 1 and connects on to the Origin/Destination pair. 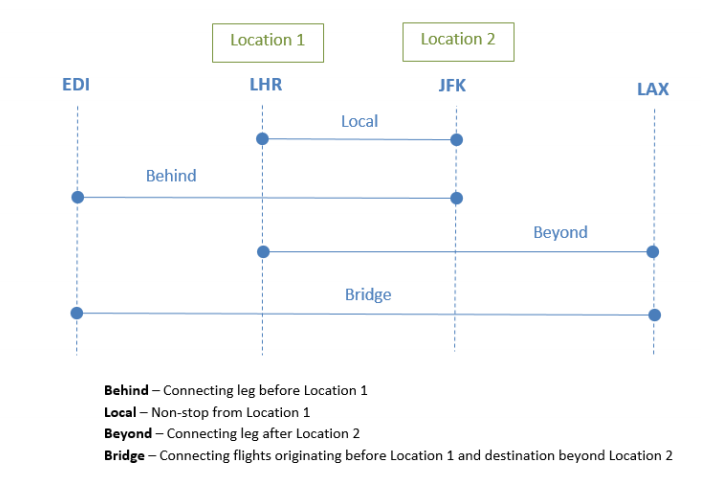 The fourth and final element of the mix is ‘bridge’ traffic, a term for those passengers who connect from another flight at Location 1 and also connect to another flight after Location 2 We will explain this using an example and the following diagram which may help you understand this. This diagram shows an origin-destination pair which is London Heathrow – or LHR – and New York’s JFK airport. Traffic between these two points is termed local traffic. Also travelling between LHR and JFK may be passengers who have connected from another flight at Heathrow but originated at Edinburgh, or EDI, classed as behind, and whose destination is also JFK. Then there may also be passengers who joined the flight at Heathrow but whose destination is beyond JFK, perhaps at Los Angeles, denoted here by LAX. And then there may also be passengers on our London-New York flight whose origin is Edinburgh and whose destination is Los Angeles. We term these bridge passengers. We’ll walk through this example to show you the outputs. We simply enter LHR in the Location 1 box, and then JFK in Location 2, then click on Run. 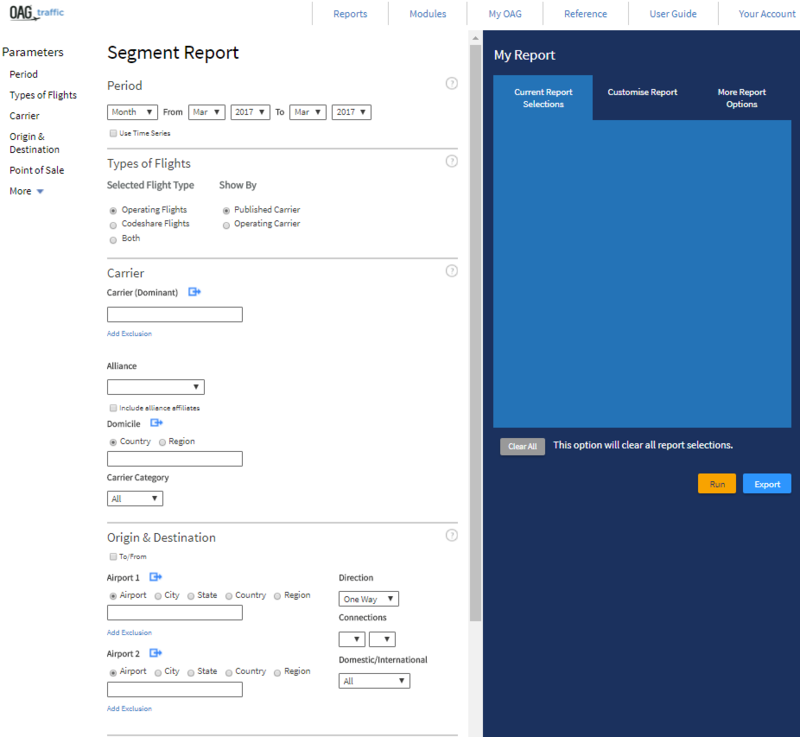 The Segment report does not have a graph or map but, like the Segment report, the Mix report results are displayed in three tabs: Summary, Mix by Airline and Mix by Route. 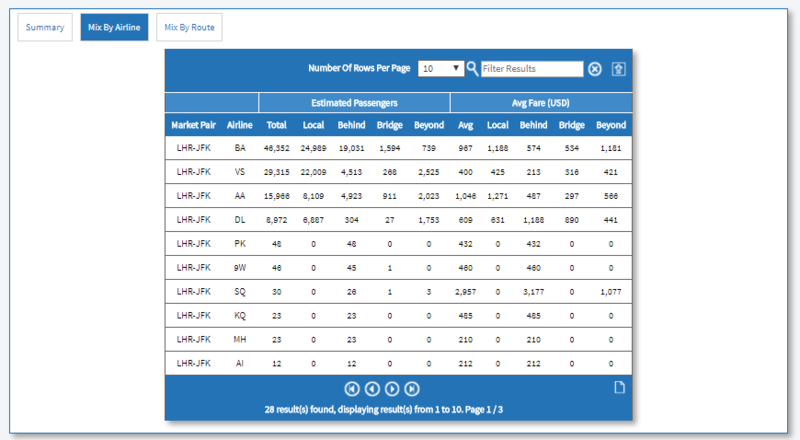 The Summary tab provides an overview of the total market size for the Locations you have chosen, and passengers are displayed by Local, Behind, Bridge and Beyond. This report also includes Average Fare data. 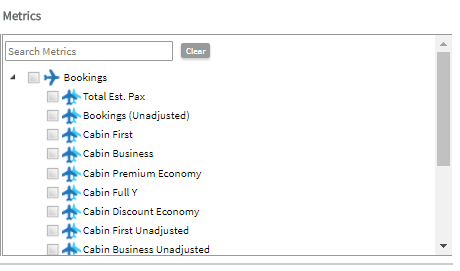 The Mix by Airline tab displays the data by airline, defaulting to the most popular carriers on the routing first. The third tab, Mix by Route gives the breakdown of individual itineraries. Composition by routing type is not displayed here, but departure, gateways and arrival points are displayed. The user guide link from Traffic Analyser for this report takes you to our website where there is a short video with a worked example of how to create a mix report. 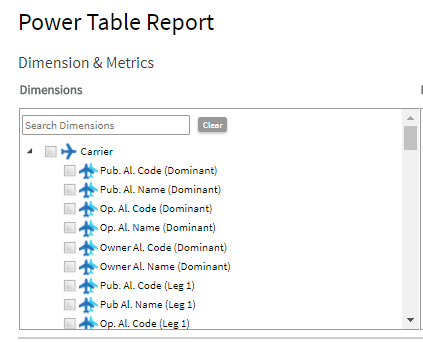 The Power Tables report is the most flexible feature of Traffic Analyser. It works on the same basis as the Schedules Analyser Power Table report and allows you to fully customise a report from scratch. The report is structured in a similar way to an Excel pivot table, allowing you to select data in different ways to slice the data. The query page is similar to the other reports but much more detailed, as the data can be ordered in so many more ways and there is no pre-determined format for this report. The first field in this report’s parameters are Dimensions and Metrics. It may be helpful to think of the selections you make in the power table as creating a table with this structure – with dimensions acting as the rows and columns that your data will be grouped into and the metrics providing the data to populate the columns. There are 5 dimension headings and clicking on the arrow next to the box opens up the dimension to show all of the sub categories and clicking on the box next to the heading e.g. Carrier, selects all the sub categories in that dimension, or you can scroll down and select just the categories you need. If you know what field you are looking for you can enter it into the ‘Search Dimensions’ box at the top and it will exclude the ones you don’t need. You still need to click on the box to add the field you have searched for. Each dimension heading has numerous sub categories so using the search field can be helpful. On the right of dimensions there are metrics. There are 5 options and all, or any combination of these, can be selected. Online fare data was added to metrics in June 2017. Be cautious of selecting more than you need as this could result in a very large report. 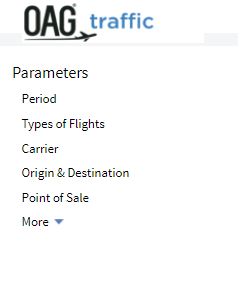 There are numerous dimensions and metrics available and a full list is available on in the glossary which you can find via the OAG user guide link from the bar at the top of Traffic Analyser. Below the Dimensions, Metrics and Categories section there are similar options to the other reports which we have covered in earlier sections. The one addition is a currency field in the More section. The default currency is USD but there are a number of other currencies that can be selected. As we’ve selected routing we can clearly identify how Chinese bookings are routing into South Africa. We can see that both DXB and HKG are important hubs. The data here is just the starting point as the next step would be to extract it out into Excel and look at the total picture for China – South Africa. As before, you can click on ‘Back to report fields’ to amend the structure or data requested in the report, or you can select any of the other fields to either export, schedule or save this query. We then click Run again and now we can see the results by departing airport point, showing us that Shanghai is the biggest source market. As with other reports, this data can now be saved, scheduled to run again at a later date, or exported for further analysis in Excel. As previously noted, if the data you have requested results in less than 1,000 rows you can click on the paper image at the bottom right of the table 35 traffic analyser User Guide to download it straight to a CSV file. If the report is larger than 1,000 rows, exporting will send it to the job bin to be processed and it can then be downloaded in your preferred format from there. 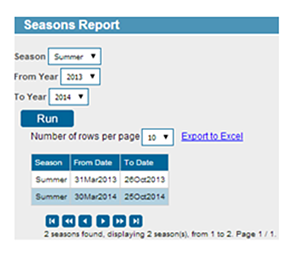 You can also expand the rows that are displayed in this output (and can do this in any of the other reports). You can select 10, 25, 50 or 100 rows to be displayed. You can also filter results by entering a relevant term e.g. airline code, airline name, airport name, etc. in the Filter Results box and the results will be displayed in the table. After filtering, again if the results run to less than 1,000 rows, you can select the paper icon to download just what you see on the screen, i.e. the filtered results. 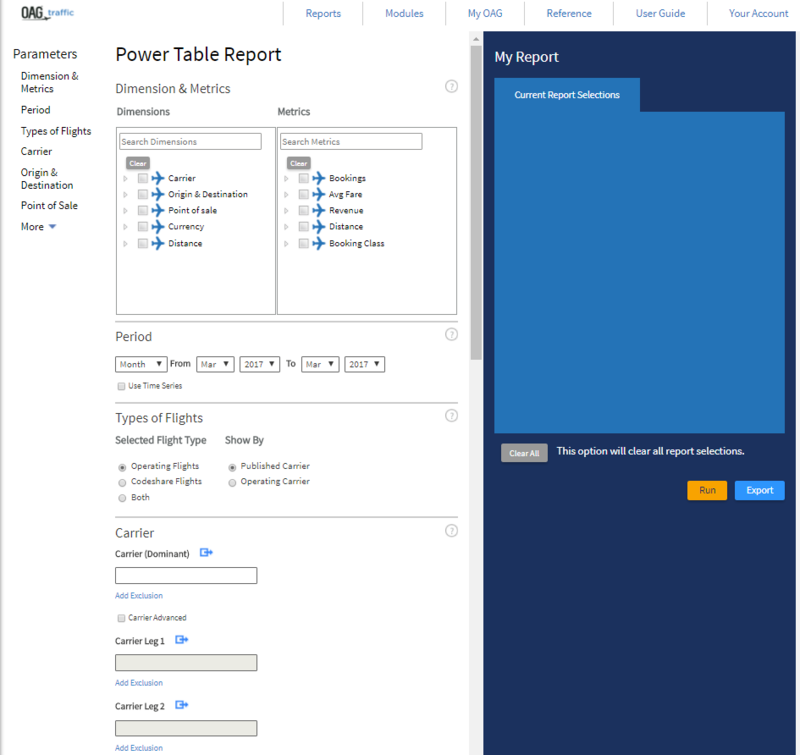 When you export the Power Table, the full power table results will be shown, regardless of any filter you have added. 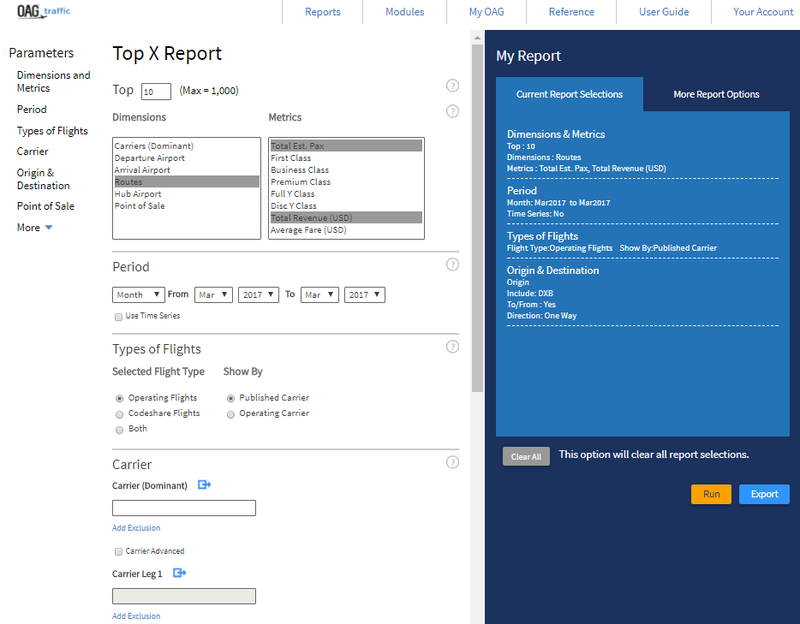 The Top X Report is another customisable report, allowing you to consider a range of data by the Top 10, Top 20, Top 100 (you can show anything from the Top 1 – 1000). 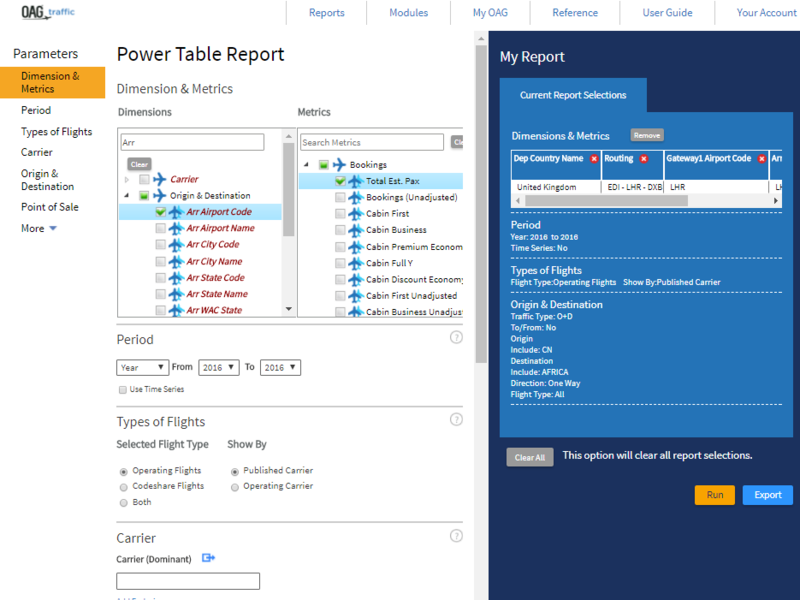 The report is structured in a similar way to the Power Table query page. In this report there are 6 dimensions to choose from (carriers, departure airport, etc) and 8 different criteria (Seats (Total), Frequency, etc) to slice the data by. To select dimensions and metrics in this report, you click on them. 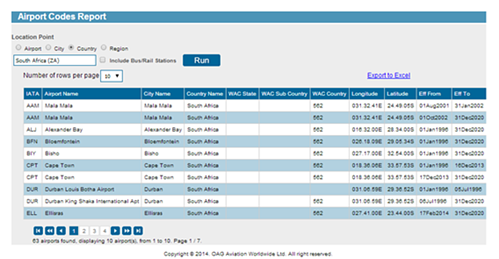 Once you’ve done that you simply click on Run and the results are displayed as shown in the example below. We’ve chosen an example to illustrate how to run this report. We’ve selected the Top 20 Routes as our dimension, Total Est. Pax and Total Revenue as our metrics, and for the time period we’ve chosen the current month, and finally, in the Origin and Destination field, we’ve selected to and from DXB. More than one dimension and metric can be selected and in the example above we’ve selected two metrics. If we were to export this and carry out some more analysis we could easily calculate average fares by carrier for this data set. A table for each metric is displayed in the output sheet. If we had selected more than one Dimension we could toggle between them. When you export this report, each table will be displayed on a separate worksheet in Excel. All the other selections operate in the same way as previously described. 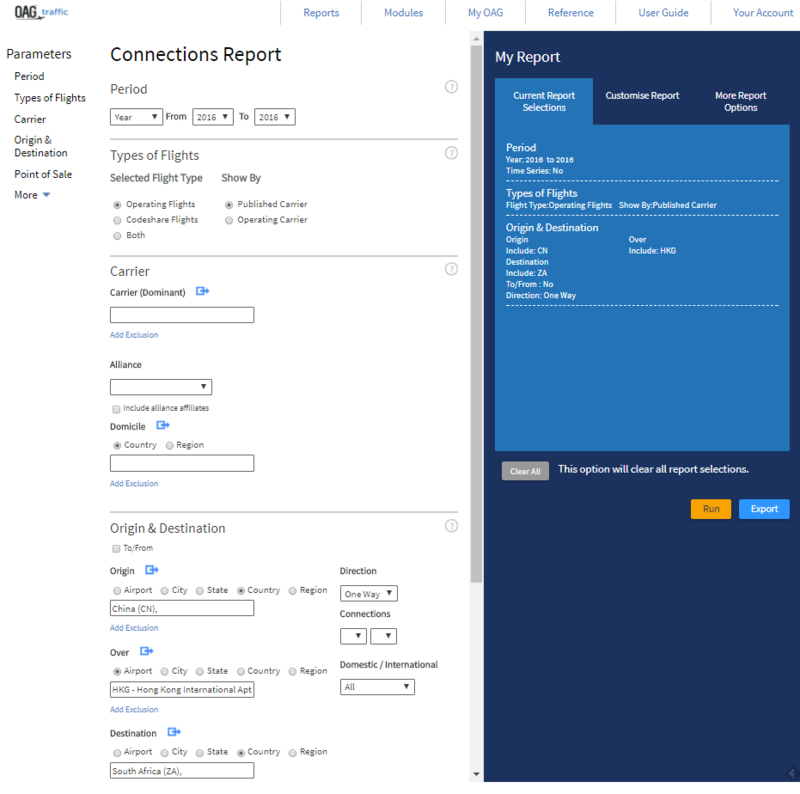 The Connections Report is very similar to the O&D Report, with just one main difference, the addition of a Connecting Point option in the Origin and Destination field. The connecting point is selected as the Over point. This allows you to analyse the traffic connecting over a particular point to look at the strength or otherwise of the ‘hub’ traffic. For example this could be SYD – DXB traffic connecting over SIN. All of the other selections operate in the same way as previously described. We’ll work through a short example of the Connections report and we’re going to take a another look at a query that we used previously in the Mix report worked example, where we consider traffic flows from China to South Africa. The first step is to select the date, we’ll look at the full year of 2016, and then our origin point – China – then the connecting point which is Hong Kong. The destination country is South Africa. 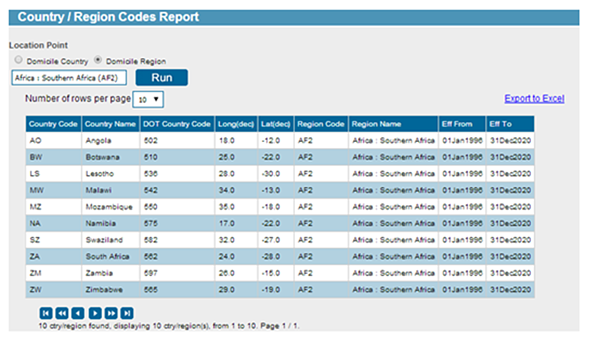 We then click Run and the results appear in the table below the report as shown in the screenshot below. 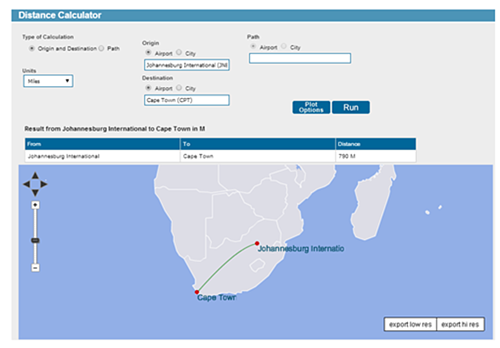 There are 4 tabs (which can be added or removed in the Customise Report tab), and in this instance, the O&D output is probably most useful as you can see at a glance where the main source destinations are connecting over HKG to and from China onto South Africa. In addition to what we saw in the Mix Report, this report provides a breakdown by class of travel. In this section we will take a look at some of the general functions that run across Traffic Analyser. These are very similar to those in Schedules Analyser. These include the ability to save reports; run scheduled reports at a certain time regularly; and to customise groups of information to make running reports with similar query types easier. There is also a detailed reference section where you can look up information on a range of areas. Saving a report and naming it means you can return at any time and re-run the report based on your original query, or amend some of the details and revisit it. To save a report in any of the Traffic Analyser reports you simply click on Save which is located at the top of the report output screen, next to Schedule. This opens up a box, as shown in the screenshot below,and all you need to do is enter a name for the report and then click on Save. 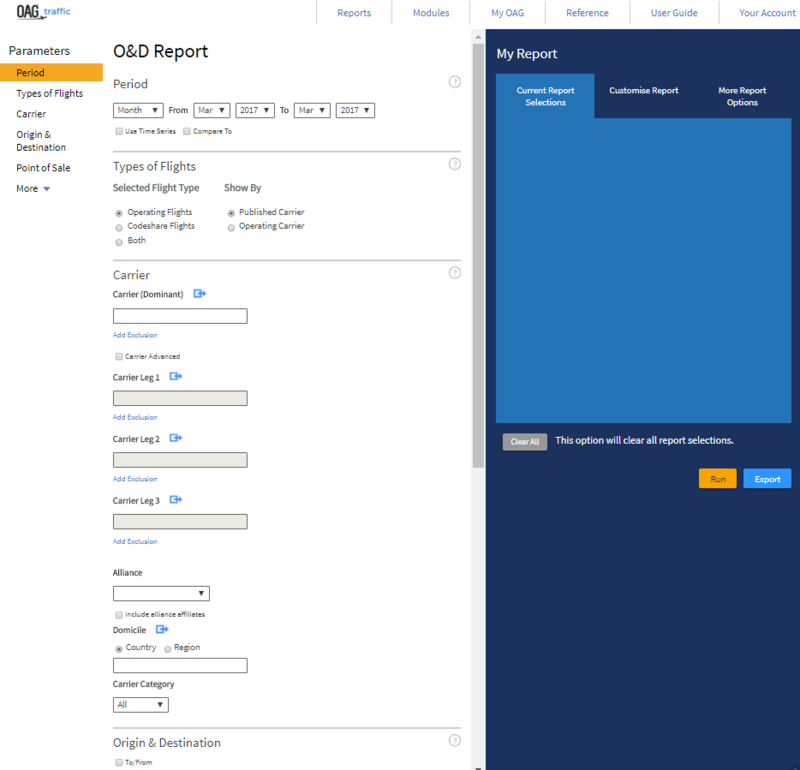 Once you’ve saved a report, you can view it from the Saved Reports option in My OAG as displayed below. My OAG can be accessed at any time from the main toolbar at the top of the screen. 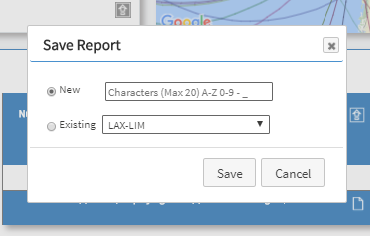 In the example below we’ve called a report LAX-LIM and you can see it then appears in the list of Saved Reports. To re-run the report you simply click on run, or open if you need to edit it. As well as saving reports you can schedule them to be run regularly and emailed to a single or multiple addresses on a daily, weekly, monthly or quarterly basis. Reports can be deleted here too. Clicking on the blue Open Saved Reports box takes you to the Saved Reports screen. You can also click through to Saved Reports from the My OAG link at the top of the screen. You give the report a name, and can add a description – useful if you are sending this onto other people, and then select the frequency you need. There are 2 different time options and the report will run at this frequency until you delete it. The last function in My OAG is that you can set up several default preferences across a range of functions, depending on how you wish to view results. 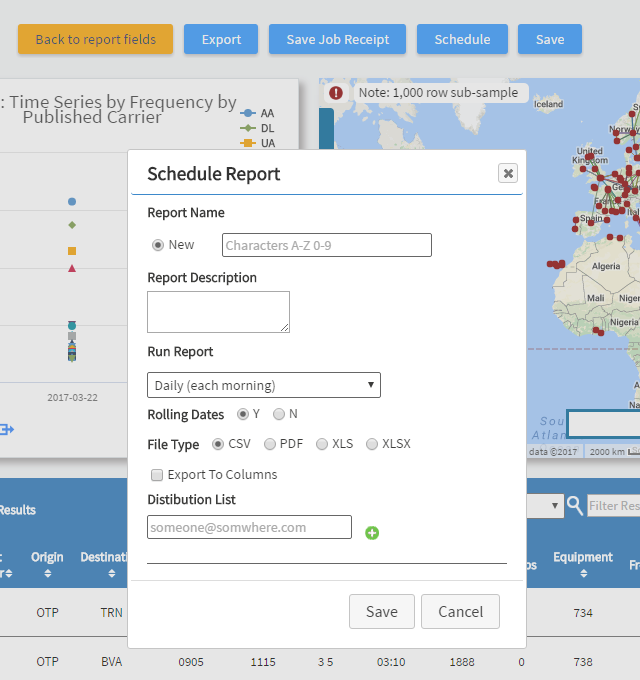 You can select defaults for Export File Types, Distance Measurement, Flight Type, Carrier Category, Period, Alliance, Cabin Type, Show Map, Show Graph and Google Map Regions. This reference section is common across other Analyser modules and can be found in the bar at the top right of the screen.